Russian carrier S7 Airlines is to relaunch its Siberian hub at Novosibirsk, as increased direct competition from the Aeroflot Group in the Moscow air cluster is forcing Russia’s second largest air company to search for alternative market niches capable of offering quick growth and relatively high profitability. Starting from the 2017 summer schedule, S7 will base a minimum of six regional Embraer E170s at Novosibirsk’s Tolmachevo Airport to perform feeder flights to onward destinations in Siberia, Kazakhstan and Kyrgyzstan. The company’s 2017 timetable promises more than 230 flights a week to enable 10 transfer flows of various types and sizes. Apart from Novosibirsk, S7 also is also banking on secondary hubs at Vladivostok (a home for two Airbus A320s covering five domestic and six international destinations) and Irkutsk (three domestic and five international flights). On top of that, the company is currently reconsidering its St-Petersburg route network and may shortly extend its capability there to up to eight domestic and three international destinations. Ever since the trans-Siberian railroad first crossed the river Ob in the late 19th century, the role of transport hub has become pivotal for the city of Novosibirsk from which, last year, Tolmachevo serviced about 4.1 million passengers, a number high enough to make it the country’s fourth largest regional gateway (after Simferopol, Ekaterinburg and Sochi) and the biggest in Russia’s Asian region. Despite its central location between the European and far eastern regions of Russia, Tolmachevo’s role as a transfer point has thus far been mostly nominal. 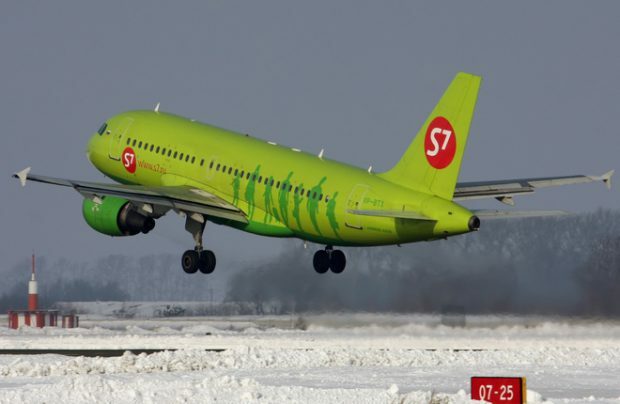 The destination network of S7 Airlines, its base carrier, included a few flights to Russia’s west, with services to Moscow, St-Petersburg and Sochi (seasonally) – the only operations performed on at least a daily basis. The company’s eastbound flights included stopovers at Khabarovsk and Irkutsk – a schedule which was not entirely in tune with the aspirations of passengers travelling from eastern Siberia and the far east for whom, compared with the limited number of connection options offered at Novosibirsk, would rather opt for either a direct flight or a transfer through one of the Moscow airports. As of today, S7 has a mix of 10 to 11 Airbus A320s and Boeing 737-800s stationed at Novosibirsk, but the volume of seat capacity on flights from Domodedovo in March of this year exceeded that of Tolmachevo by a factor of almost five, which eloquently describes the role and place of the once native port in the carrier’s business model. The inverse dependence is much stronger though: S7 Airlines covers 54% of available seats from Tolmachevo as well as 38% of all airfield operations. By comparison, in March this year, Yekaterinburg-based Ural Airlines had a share of only 36.5% of available seats and 26% of airfield operations at its homeport of Koltsovo, whereas the capacity contrast between Moscow and Yekaterinburg was approximately 2.5 times. The demand potential in the Novosibirsk region is naturally limited by its modest population size (2.8 million people), as well as a lack of large businesses in the region. To deal with this problem, the airport’s operating company has nevertheless made a significant contribution by improving the ground transport connectivity infrastructure, thereby allowing the airport’s hinterland to expand. In reality, this market niche will always be relatively small and it is likely that a higher than average growth in the near future will be achieved only by fostering the gateway’s potential as a successful transfer hub. This is where the strategically favorable geographic location of Novosibirsk, amid European Russia and the far east, will be especially convenient for connecting traffic flows generated by narrow-bodied services (See Picture 1). Apart from S7 Airlines, the core operator at Tolmachevo, other statistically significant contributions to the transit passenger business flow come from some minor regional carriers that use it as an interim connection point and inevitably snap up some of the local demand. The population of Novosibirsk, the largest city in the Ural region, is 1.6 million people. The tectonic shifts that the air transport industry experienced after the outbreak of the economic crisis compelled the S7 Group to not only reconsider its market niche, but also the future of its Novosibirsk hub. All of a sudden, S7 Airlines had emerged as the second best Russian air carrier in terms of passenger traffic, even though it was still a long way behind the dominant Aeroflot Group. Considering the four-times smaller scale of operational performances compared to Aeroflot, and the national carrier’s lobbying power, gambling on a development strategy within the profitable and boundless Moscow air cluster would have been a high risk option. Instead, the company is re-evaluating its priorities in favor of the peripheral Novosibirsk, Vladivostok and St-Petersburg alternatives. The abrupt demise of Transaero, as well as the flat-rate pricing philosophy on Aeroflot’s flights from Moscow to Russia’s Far East, triggered an unpleasant though anticipated severe seasonal shortage of available capacities, especially in economy class. However, the central location of Tolmachevo made it possible to more than double the number of transfer passengers and increase its share in the overall market by nine per cent within just two years (See Picture 2). The renaissance of the Novosibirsk hub into a transfer point for far east flights began with the 2016-2017 winter schedule, when direct flights to Yuzhno-Sakhalinsk, Petropavlovsk-Kamchatsky and Magadan were introduced, substituting those with stopovers at Khabarovsk. In the coming summer schedule, the overall frequency of these six domestic flights to far eastern destinations is expected to grow by 23%. Except under short-supply market conditions, competing with the direct wide-bodied flights of the Aeroflot Group in the Moscow air cluster is difficult or impossible, but it seems S7 Airlines has set itself no such onerous task. With Moscow continuing to be the key departure/destination point for Russian far east airports, especially in the corporate segment, it is definitely not the only pebble on the beach – and a panoply of narrower market niches remain exploitable (St-Petersburg, or some various southern cities, for example). Since Transaero’s demise, the Moscow air cluster has been the only realistic connection option, and so Novosibirsk appears to be a natural viable transfer alternative which, orthodromically, is more efficient than Moscow. Probably, prospective passengers will not be too happy to know that S7’s narrow-bodied fleet, especially its Boeing 737-800s, are not designed to perform five-to-seven-hour flights – both in terms of the seat configuration and the missing in-flight entertainment systems. But, at the same time, Aeroflot’s Boeing 777-300s are not comfort champions either. While a typical Russian passenger is notably undemanding, a half-way stop break at Novosibirsk can at least smooth out the hardships of the trip. The significant depreciation of the ruble unexpectedly brought a positive aftermath in the way that it boosted inbound tourism from China. On the one hand, Novosibirsk will hardly evolve into a tourist mecca, even for the Chinese, who generally may not be accustomed to cultural or architectural masterpieces. On the other hand, Tolmachevo will undoubtedly reap the benefits of its geographical position as a transfer point for Chinese tourists flying on to Moscow or St-Petersburg (or beyond to Europe) considering the market scale of China’s outgoing tourism is gigantic and growing. The 2017 summer schedule of S7 Airlines will see a total of 16 weekly frequencies to Beijing, Shanghai and Urumqi (up one third on the last year’s timetable). Remarkably, the two transfer flows to the Chinese capital allow convenient connections to Moscow and St-Petersburg as well as to a number of European tourist destinations, such as Frankfurt, Dusseldorf, Prague and Tbilisi. Flights to Urumqi (with one passenger flow) offer the same transfer opportunities, whereas Shanghai flights fit Russia’s domestic connections only. It would be impossible to enter the promising and thus far underdeveloped transfer market from west-Siberian airports (including the Tyumen region) without the availability of regional aircraft. The smallest currently available in the company’s fleet – 144-seat Airbus A319-100s – are Moscow-based and do not suit a high-frequency feeder program from Tolmachevo. That is why the company’s owners and management have instead opted for the Embraer E170, in a 78-seat single-class configuration. These aircraft will be delivered from the second-hand market in the 2017-2018 period and will allow S7 to increase its frequencies on a large number of currently operated destinations in Russia, Kazakhstan and Kyrgyzstan, as well as a few new ones like Tyumen, Novy Urengoy, Nizhnevartovsk, Noyabrsk and Gorno-Altaisk (Picture 3). It is quite possible the company will also launch services to Omsk, Abakan, Karaganda (Kazakhstan) and Issyk-Kul (Kyrgyzstan) next year. All destinations in Khanty-Mansi and the Yamalo-Nenets autonomous regions and in the Republic of Altai are subsidized by the Russian government. 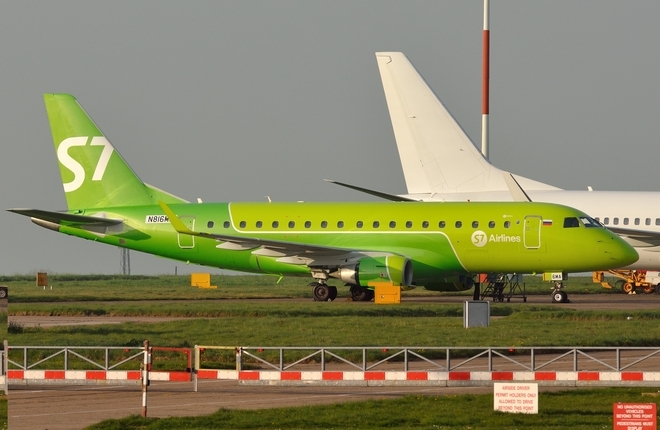 Judging by the official timetable, S7 Airlines will need a minimum of six Embraer E170s to service its Novosibirsk portfolio of flights and at least two regional jets will be required at Moscow, to perform flights to Nizhny Novgorod, Voronezh, Astrakhan, Nizhnekamsk and Petrozavodsk. The airline has also announced the launch of flights from St-Petersburg, which will be operated on both a subsidized and a commercial basis, including international flights. The list of subsidized routes in 2017 will include Bryansk, Ivanovo, Kaluga, Kursk and Yaroslavl (with the frequency of two weekly flights). As for purely commercial destinations, tickets are now available for flights to Kaliningrad and Berlin, plus the company has received approval to service Dusseldorf and Zurich. Despite limited capacity and the fact that these operations will probably fail to generate a profit, the flights from Pulkovo have political significance, as the administration of St-Petersburg is not fully satisfied with the effort Aeroflot has put into developing its subsidiary airline Rossiya in the city. In the coming summer, S7 Airlines is expecting to perform an average of 33-34 flights a day from Tolmachevo, although this figure may become even bigger. Capacity (in terms of available seats) is expected to grow by 35% on the winter schedule and by 24% compared to the 2016 summer schedule. Russian Aviation Insider estimates that, in order to achieve these goals, the airline will need at least 12 medium-range Airbus A320s and Boeing 737-800s home-based at Novosibirsk (flights to Moscow are carried out by Domodedovo-based aircraft) – and at least six regional Embraer E170s. Apart from the aforementioned Embraer E170 services, S7 is also about to start servicing Rostov-on-Don (twice a week), Tbilisi (once) and Dusseldorf (once) utilizing Airbus A320-200s and Boeing 737-800s. The company is to suspend Norilsk operations (due to runway reconstruction works) as well as seasonal flights to Hong Kong. S7 Airlines’ schedule – available on the company’s website – suggests there will be 10 transfer flows of various sizes from Tolmachevo with some of them overlapping and therefore offering additional transfer capacities. The actual transfer capacities of the gateway are higher than those indicated in the table (above), as passengers often choose connections that are far from optimal and subsequently spend several hours waiting for their next flights. Should the hub model at Novosibirsk prove to be a success, S7 Airlines may decide to scale it up by introducing a fourth flight from St-Petersburg, with a departure time around 15:00, and launching extra frequencies and destinations within the European part of Russia (to Krasnodar, Rostov-on-Don and, later, to Kazan, Samara, Chelyabinsk, Ufa, etc.) for example. According to Russian Aviation Insider sources, S7 Airlines is also pondering the possibility of developing regional transfer services from Chinese cities to central Asia and Kazakhstan, although Novosibirsk will surely face difficulties in competing with the much more developed Urumqi hub of China Southern, as well as the transfer options of Air Astana in Astana and Almaty. It would be impossible to relaunch S7’s hub at Tolmachevo without the development of the port infrastructure there. The reconstruction of International Terminal B was finalized in 2015, giving it an additional 17,000 square meters of floor space and enhancing its departure capacity from 240 to 650 passengers per hour. Fortunately, the company’s transfer flows are spread relatively evenly around the clock, a factor which saves both the airfield and the terminal infrastructure from overloading. There are 73 departures per week within the period from eight am and 12 am (an average of 2.6 departures per hour), 61 departures between one pm and four pm (2.9 departures per hour), and 72 departures between 8.30 pm and midnight (2.9 departures per hour). At the same time, S7’s morning passenger flow is accompanied by departures to Moscow of Aeroflot, Ural Airlines and VIM-avia, a situation which creates additional burdens for the airport and questions the adequacy of the existing infrastructure inside the domestic passenger Terminal A. Its planned daily departure capacity comprises a maximum of 800 people and still demands the rapid processing of passengers at check-in counters, security checkpoints and boarding gates. This means the floor space inside the Terminal A concourse (excluding the retail zone and food court areas) is considered insufficient to provide a comfortable visit, especially during the morning rush-hour, or the evening crush from 22.30 to midnight during the 2017 summer schedule. The old terminal infrastructure is markedly under-developed so that it cannot quickly and efficiently expedite the growing numbers of transfer passengers, and yet the airline forecasts that, in 2017, the annual passenger flow at Tolmachevo will grow by 14% to reach 4.7 million people. Russian Aviation Insider estimates that the number of transfer passengers will grow by 40-50% to almost a million (making up roughly 20% of the overall number of passengers). The newly-reconstructed terminal B has a detached transfer corridor link for international connections, while the infrastructure in terminal A is either nominal or sometimes unavailable at all. The airport also lacks a specially designated corridor link between the two terminals and, as a result, the minimum average connection time at Tolmachevo is now up to 80 minutes for domestic flights and 120 for combinations of domestic and international flights. Critically, those statistics lag well behind passenger growth expectations, as well as the competitive operational performances at rival Russian and foreign airports. Despite these issues, there will be no restrictions in terms of airfield infrastructure development at Tolmachevo, experts say. The airport has two hard-surfaced runways, with the overall capacity of 29 airfield operations per hour (taxiing included); runway 16 is ILS CAT II approved; and two more runways are ILS CAT I capable. The airport’s apron can accommodate up to 62 aircraft. The airport’s operating company ‘Aeroport Tolmachevo’ has confirmed to Russian Aviation Insider that a decision about the reformation of terminal A will be made this year, while the reconstruction works themselves will be carried out in the next two years. The project suggests there will be a new skywalk between terminals A and B, which will allow transfer passengers between domestic and international flights to change aircraft without leaving the airport’s ‘clean’ zone.